Plant Buggy Sales – Wreaths! Inspiration struck and the creative team of Elizabeth Overcash (children’s program coordinator) and Lizzi Lathers (research technician) created some incredible wreaths to sell on-site at the JC Raulston Arboretum. Numbers are limited and each wreath is an individual work of art using Fraser fir combined with highlights and accents from the Arboretum. 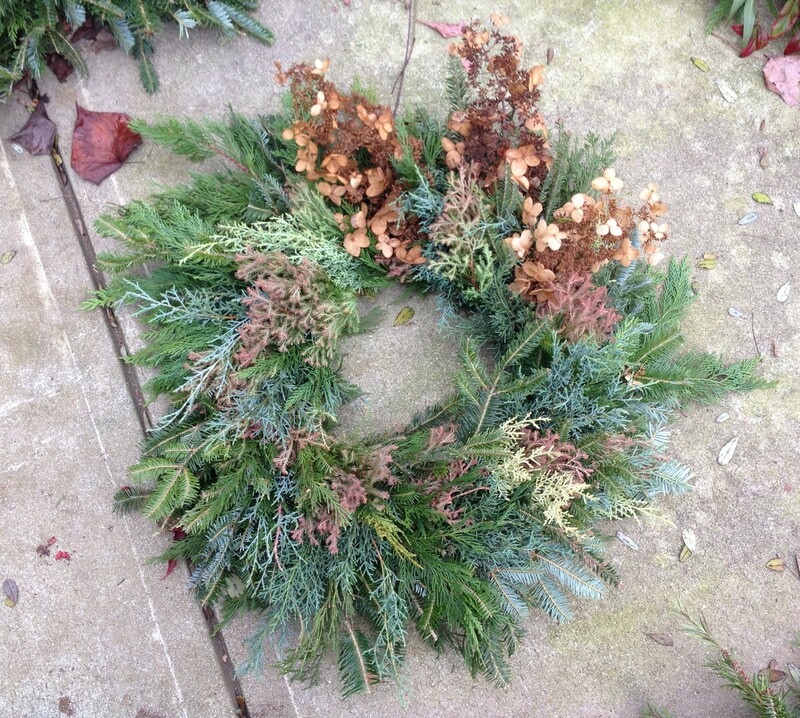 This wreath features dried hydrangea and a variety of conifers, others have bright berries, willow twigs, and pine cones. The wreaths will be available until they sell out but we anticipate high demand during our annual Poinsettia Open House on Sunday, December 8 from 1pm – 5pm. Other gifts available then include cards and JCRA apparel. NC State Floriculture is part of a national poinsettia program that tests poinsettia cultivars to determine which ones are best for consumers and for producers. You will have a chance to see these cultivars yourself and vote for your favorites. Approximately one hundred different cultivars of poinsettias—including numerous new experimental cultivars—will be on display. 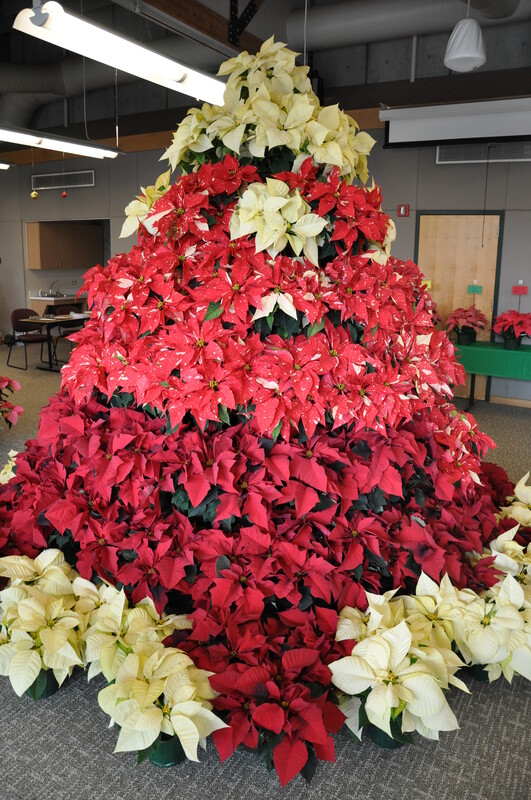 Stop by to see the famous 9′ tall poinsettia tree. 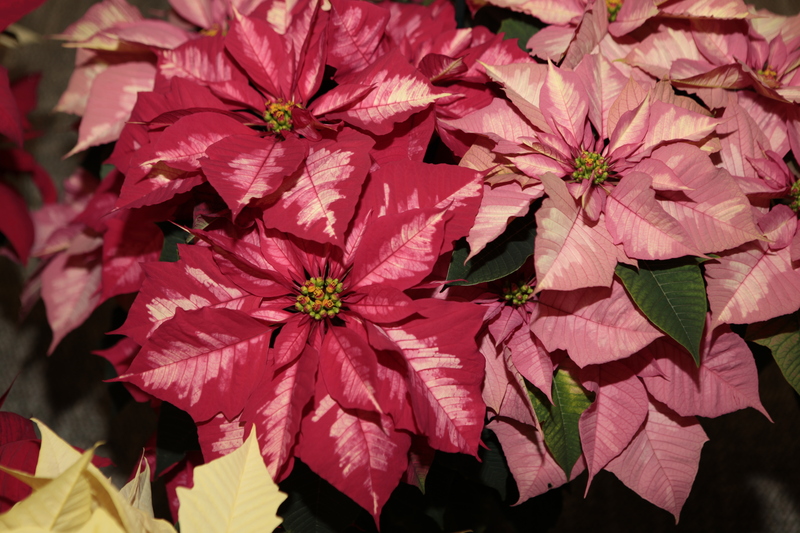 Enjoy poinsettia gardens and decorated poinsettias. Help us decide which poinsettias are North Carolina’s favorites by voting for your favorite poinsettias. The scene of many holiday pictures. Festivities at the Poinsettia Open House include live music where you can listen to Christmas carols from around the world played by the Joy Recorder Ensemble while viewing the poinsettias. They’ll begin at 1:00 PM and play through 5:00 PM with three 15 minute breaks. The diversity of new poinsettias is amazing to see. This entry was posted in Plant Buggy, What's Growing On and tagged poinsettias, wreaths on December 5, 2013 by Mark Weathington. Fall is for planting! 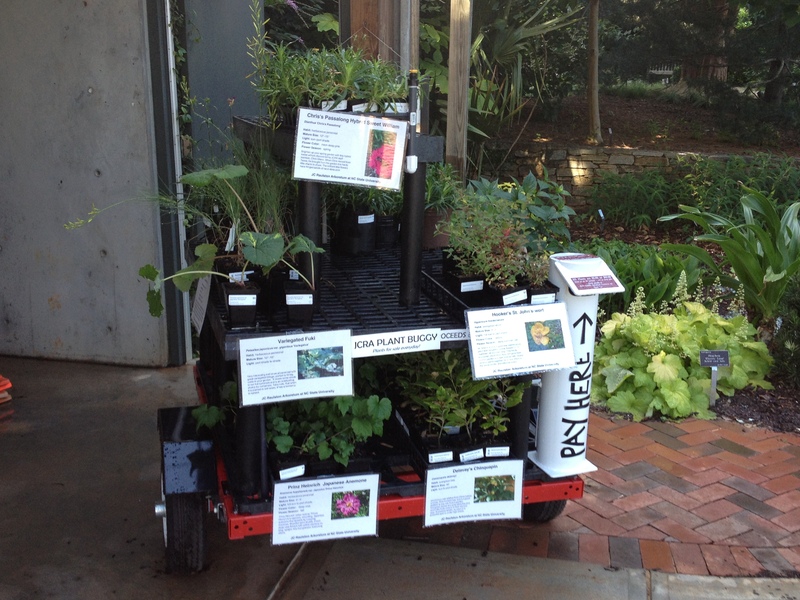 So come on out and see what we have for sale this week on our Plant Buggy outside the Bobby G. Wilder Visitor Center. Remember it is cash or check only and we don’t have change. Most plants are $5 with a few $10 ones thrown in as well. Our staff and volunteers continue to propagate some of our favorite plants to offer our visitors. Here is a selection of a few of the plants on the trailer this week. Aster ageratoides ‘Ezo Murasaki’ – An outstanding Japanese selection of Asian aster. It has incredible medium-purple, frost-resistant fall flowers. It forms a low mat of foliage and spreads quickly by underground stolons. Be prepared, because it will fill a large area in the garden in short order. Simply stunning in fall, makes a great ground cover in sun to part shade. 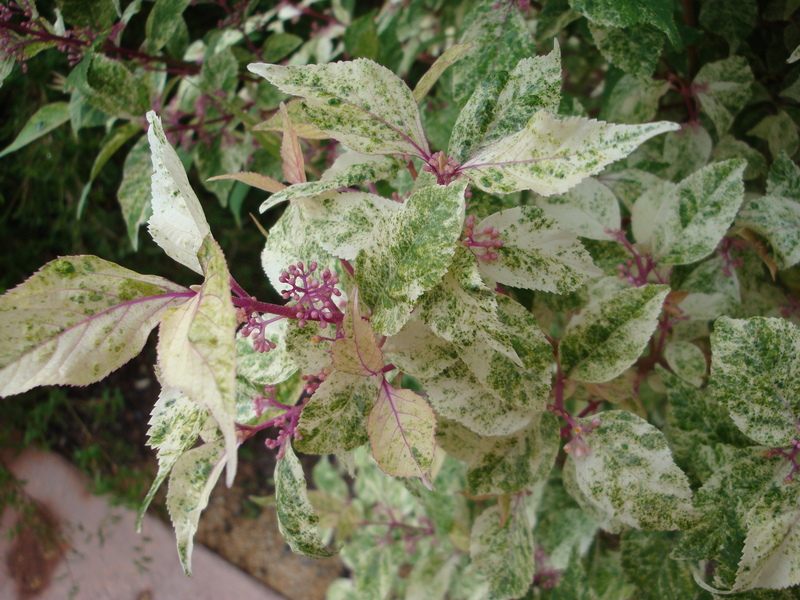 Callicarpa japonica ‘Shiji Murasaki’ – A heavily variegated form of beautyberry with green leaves splashed and speckled white. New growth emerges pink and young stems are pink. Unlike the typical Japanese beautyberries, this form seems to grow somewhat upright and is heavily branched with none of the arching characteristics usually seen. Flowers are pinkish and so far we have seen no fruit set. Our plant has been surprisingly vigorous for the amount of variegation and has not burned in full sun with minimal irrigation. Grows best in sun to shade conditions, reaching an ultimate size of about 6′. Heavily variegated foliage is surprisingly sun tolerant. 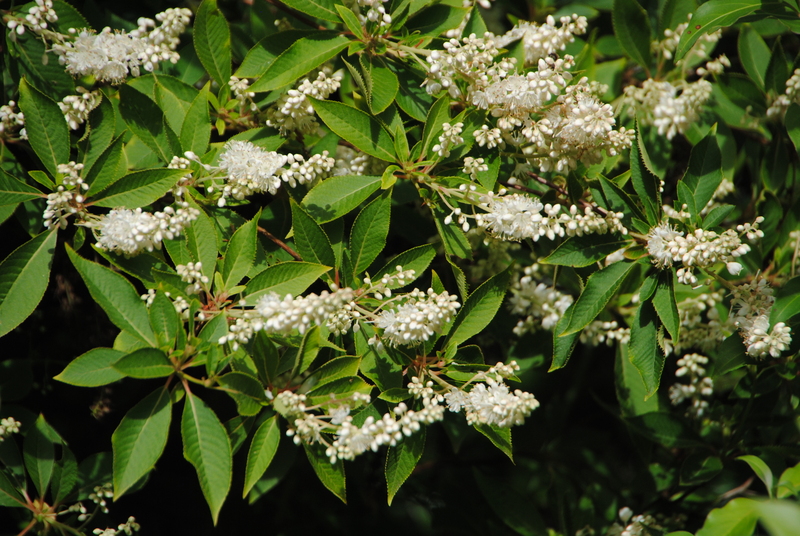 Clethra barbinervis – Whether you call it Japanese pepperbush or Japanese summersweet, you will admire it for its sweetly-scented white flowers, produced in summer, and the richly exfoliating bark specimens attain with age. Grow as an upright, open shrub or a small flowering tree in sun to shade. Masses of white summer flowers are sweetly fragrant. Gardenia jasminoides ‘Shooting Star’ – ‘Shooting Star’ is a compact cultivar of gardenia noted for its winter hardiness and large, fragrant, single white flowers up to 3” in diameter in late spring. Its glossy, evergreen leaves will add beauty to your garden all year long. Hydrangea serrata ‘Ô amacha Nishiki’ – A lovely small lacecap hydrangea with flowers that tend toward the pink rather than blue. The foliage is heavily dusted with creamy white which helps light up the shade garden. 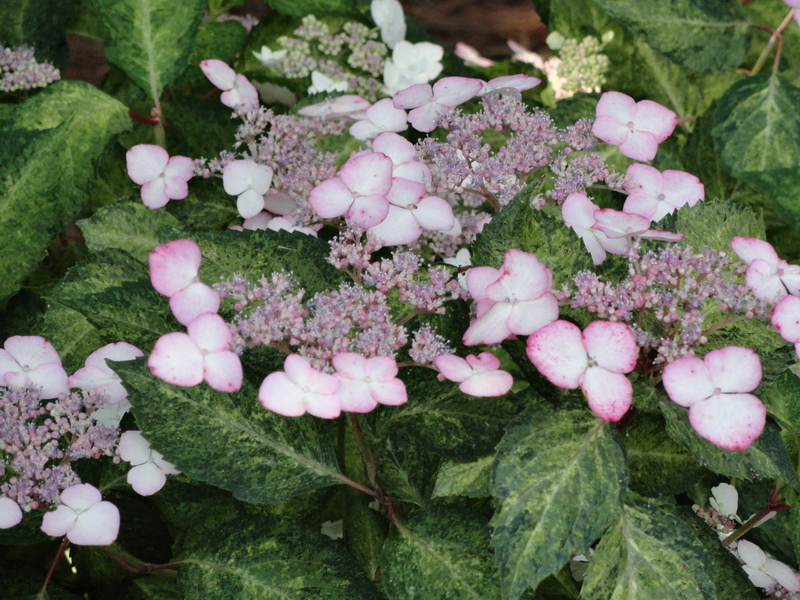 Pink lacecaps and speckled variegation make this plant a winner. 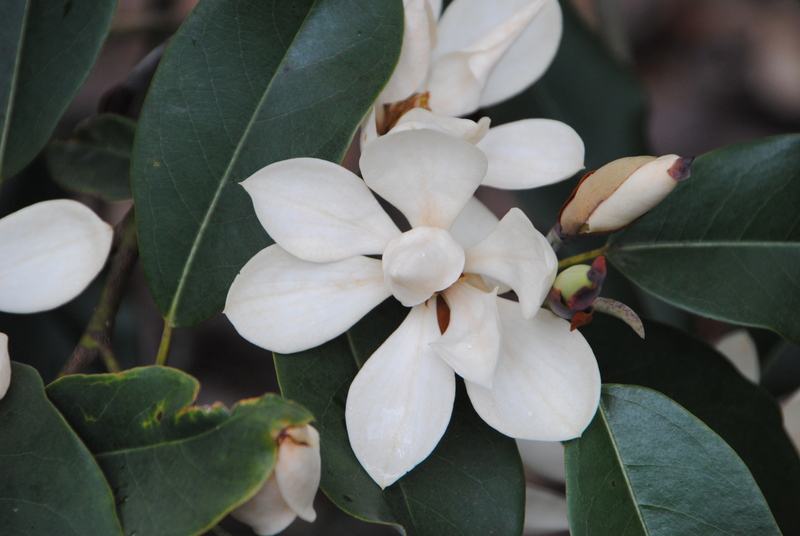 Magnolia maudiae – Enjoy the intoxicating fragrance of pristine white flowers in late winter on this evergreen magnolia. Flowers are large (4″-6″) and it has been described in bloom as “one of the greater surreal experiences of horticulture.” Plant in a location that has protection from cold north winds. Pristine white winter flowers backed by evergreen foliage are a delight in the garden. Sinningia ‘Bananas Foster’ – From May until frost you will enjoy this delightful hardy gloxinia in your garden. 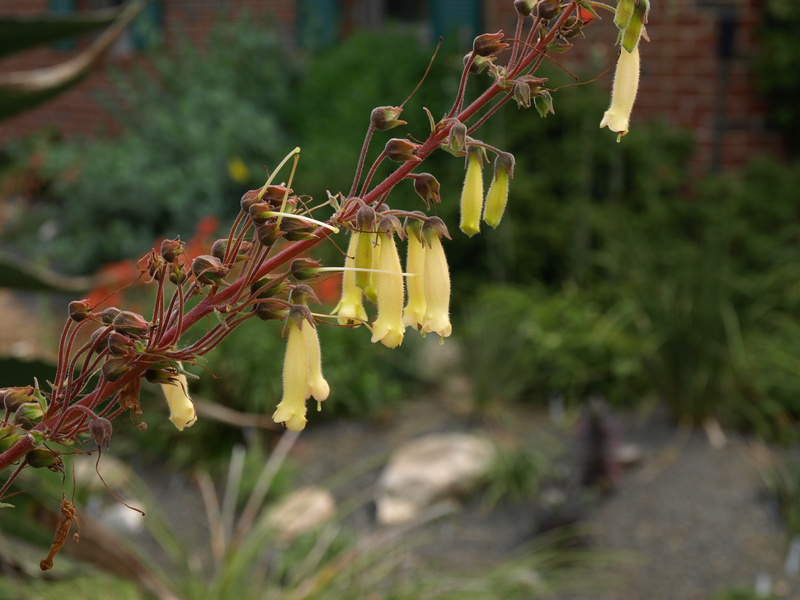 True to its name, it produces dozens of 2″ pale yellow tubular flowers. 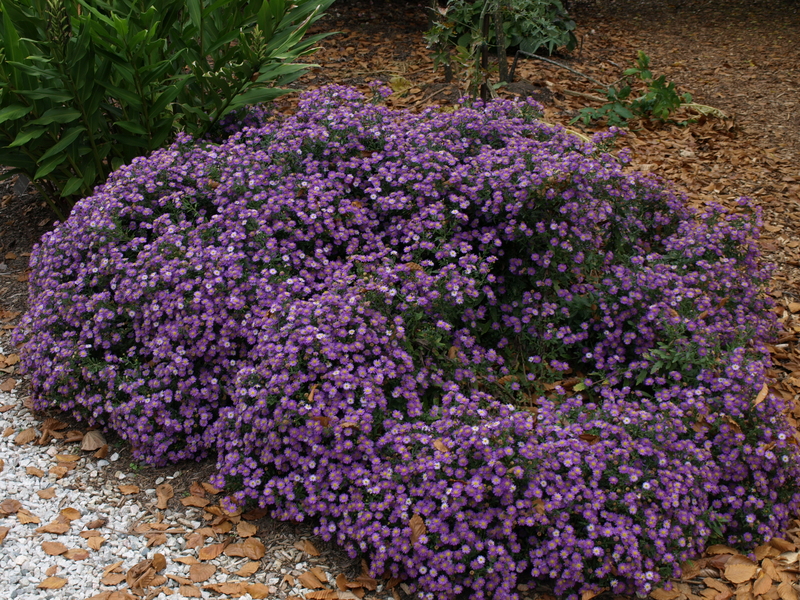 It is very drought tolerant and perfect for a rock garden or other sunny location. It is such a very cool and desirable plant. Tubular yellow flowers on red stems last all summer long. 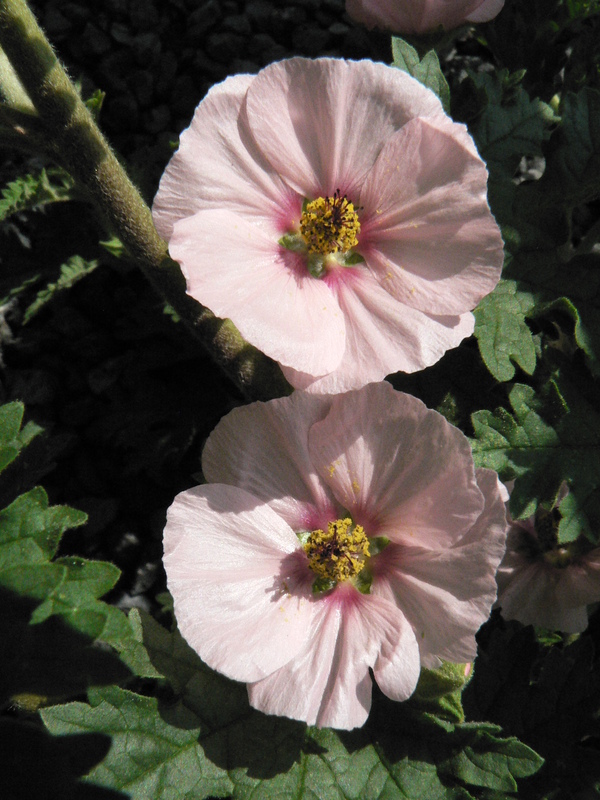 Sphaeralcea ‘Shell Pink’ – This lovely globe mallow is widely touted as an annual plant but has been perfectly hardy for us over the last five years in a well-drained, sunny spot. The hibiscus relative makes a spreading plant with silvery leaves and pink flowers. It will look great in containers or hanging baskets as well as in the garden but may not be hardy in a pot. Pink hibiscus-type flowers are quite lovely. The JCRA Plant Buggy for onsite sales. This entry was posted in Plant Buggy, What's Growing On and tagged callicarpa, gardenia, Hydrangea, magnolia, plant sale on September 27, 2013 by Mark Weathington.